I love this necklace by LuxeDeluxe over at Etsy. I was looking at my collection of buttons yesturday. My Mommy gave me a bunch of buttons that my Grandma had saved. She saved everything. There is even a button from a dress my Mom wore in College. My Mom would say, "Kat, you find a button you love and make yourself your own necklace." I just might. 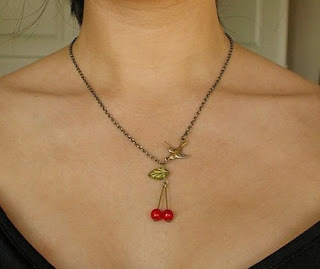 Oh, this necklace by LuxeDeluxe is super cute too. 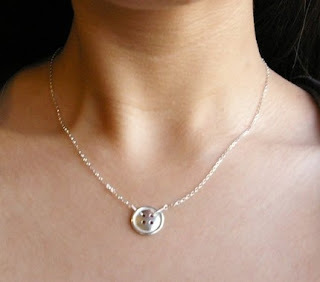 What a great idea to make a necklace out of a button. It would be so meaningful too to have a button from someone that you loved. I love that idea. Makes me want to go and find a special button. Hey, thanks for leaving a comment. Dan had told me where to find you, but my brain did not retain the exact info. I just had some fun catching up with you here. mama likey. hope your birthday month rocks. Those really are cute necklaces. Do show what you make if you make one...with all those buttons you will probably make something priceless and gorgeous! Cute as a button is right. So sweet Kat - but, yeah, you could so make your own for about $5!